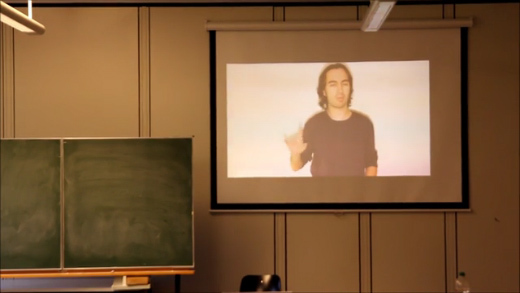 Interactive use of filmed sequences in the EFL-classroom, or how to surprise your students! by Miriam Del CastilloValeriano (student of Primary School Pedagogy, Spain), Miquel Mayordomo Bofill (student of Pedagogy, Spain), IvánRegadera Ruiz (student of Pedagogy, Spain), Prof Michaela Sambanis, Stefan Evers, MichajaKrafschek, Sophie Mibus, Katerina Mihova, AnjaMinke, Silvio Päpke, Luise Schreiber, Julia Totzauer, AgnieszkaWolf, and Maja-Svea Purrmann / Prof Michaela Sambanis as editorial team. In our seminar “Kompetenzorientierung” we talked about findings from neuroscience with regards to possible consequences to the EFL-classroom (optimization of the teaching and learning of a foreign language). We discussed recent studies on the effects of body-movements coupled to the learning of new vocabulary (Hille/Sambanis et al. 2010, Sambanis 2011, Macedonia 2011 etc. ), we talked and read about the plasticity of the brain, took a look at brain mechanisms, discovered that we all possess an inbuilt novelty-detector, and examined the question how emotions influence learning. In this connection, we also discussed the enormous potential of storytelling and the creating of stories with EFL-classes. All students participated actively in the course, taught by Prof Sambanis, and contributed as experts or expert teams to different topics. One of those expert teams consisted of three students from Spain (ERASMUS-program), attending the above-mentioned class in English didactics at the FU Berlin: Miriam, Miquel and Iván. They opted for the topic “creating stories/using media” and managed to surprise us all with a really good, curiosity-evoking and effective idea that can be used in various ways and applied to different teaching settings. We would like to share it with you, which will be done as interviews with those who were lucky to assist.